How can tiny, self-insuring companies, with say only 30 or 80 workers, bear the risk of unexpectedly large claims? They buy reinsurance, also known as stop-loss coverage. Stop-loss kicks in when somebody’s bills top, say, $20,000 or $50,000. Say you’re a self-covered small business with 70 employees. Your normal annual medical bill is $400,000 (no family coverage), and you hire the local Blues or somebody else to handle the claims administration. If a worker gets cancer and the bills soar into six figures, you pay only the first $20,000. The stop-loss plan handles the rest. Brokers have been increasingly promoting self-coverage as an Obamacare “escape hatch”, since businesses that self-insure are exempt from the law’s unpopular requirements. ACA limits on health insurance profits also don’t apply to reinsurance. Therefore, companies with as few as 10 or 20 workers are reportedly now self-insuring, protecting themselves with stop-loss that kicks in at levels as low as a few thousand dollars. To the employer, the employees and the world it looks like regular health insurance without the ACA rules. (The employer mandate was delayed for a year, but not all regulations affecting insurance were put off.) Small businesses see it as a way to offer coverage and avoid rate shock. ACA fans see it as gaming the system. The growth of self-insurance means big things for AllyHealth! The growth of businesses self-insuring is pretty exciting for AllyHealth and telemedicine. Because of the fact that AllyHealth consultations with doctors are completely free for our members, our telemedicine platform means big savings for self-insured businesses (those avoided emergency room and urgent care visits add up quickly to huge savings that the business otherwise pays for!). Every time one of your employees uses our service, one more unnecessary trip to the primary care physician, urgent care or ER is avoided. If you look at the claims history for any group and isolate just the 15-minute or less visits, the cost savings is tremendous. Add to that the fewer sick days employees are taking and telemedicine just makes sense. You will easily save more money in a single year than you will pay in fees for the AllyHealth membership for your employees. That means that the convenience of your employees having a doctor on demand, anytime, from their smartphone or computer is a net no-cost investment for your business. 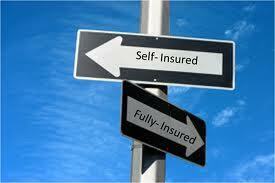 Telemedicine and Self-Insured Businesses – A Perfect Combination! We recommend you look into telemedicine if you self-insure. Let us help you calculate the expected cost savings that you will realize. Improve your culture, employee productivity, and bottom line with AllyHealth. Win, win, win… what’s not to like? It’s a no brainer decision and your employees will appreciate it.